Activities run throughout the day. 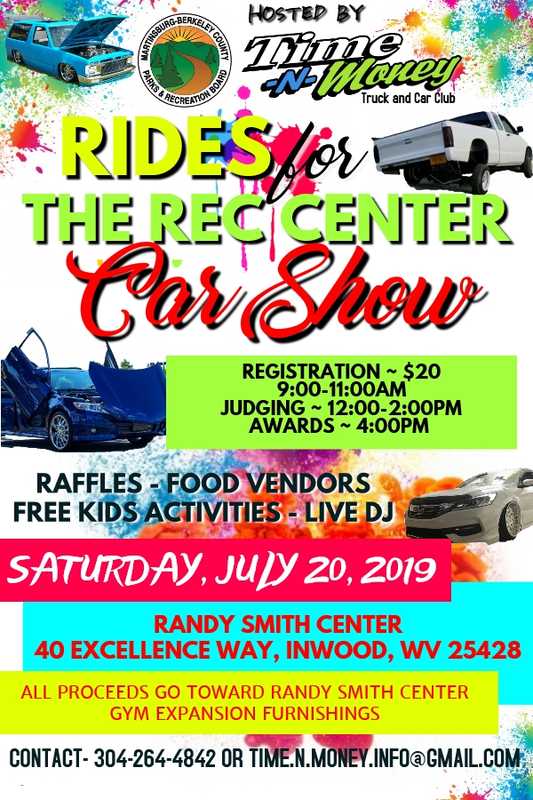 The Time-N-Money Truck and Car Club is hosting their Annual Car Show with Parks and Rec this year! This event is being held to help raise funds for the new Randy Smith Center expansion project. The entry fee to enter the car show is $20. There will be raffles, food, music and activities for kids! Vendors will also be set-up a this event. All proceeds will go directly to M-BC Parks and Recreation- Randy Smith Center Expansion. For those who are interested in helping sponsor the event, donate raffles/supplies or volunteer please contact 304-264-4842 x16 or email lauren@mbcparks-rec.org or time.n.money.info@gmail.com. FOLLOW THE EVENT ON FACEBOOK!